Whether Prime Minister Narendra Modi’s unscheduled halt at Lahore en route from Kabul to Delhi on December 25 last year caused more ripples in India or Pakistan has been a matter that set off a series of high-octane debates on and off Media in both the countries. Modi’s out-of-the-box diplomacy was, in fact, an act of goodwill and friendship borne out of an abiding interest in bringing about peace on both sides of the border. It has apparently stemmed out of the realization that the manmade line had not always been there and the conviction that it would quite likely not be there forever once the peoples of the two nations decide to ditch it in favour of the ties of friendship and fraternity binding them together. While the above scenario may sound too farfetched, history has not been without instances of the reunification of countries divided by borders and walls of hatred and hostility, such as Vietnam and Germany, to name but two. The hug witnessed at the Lahore airport between Narendra Modi and Pakistan Prime Minister Nawaz Sharif on the former’s landing at the airport, made the place sizzle with warmth on that wintry morning and left the Opposition parties in India and the non-State players and other potential spoilers in Pakistan gawking in disbelief. One wall down, many more to go, gloated peace-loving sections of the media and the society in both the countries. Indeed, one small step for man and a giant leap for the cause of enduring peace and friendship in the subcontinent. Only a mind which knows no fear could have conceived such a move. 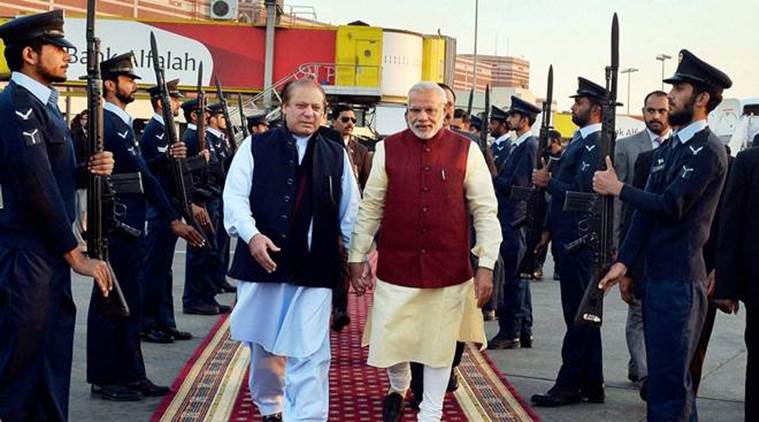 Even before the media had stopped glossing over how Nawaz Sharif had sported at his granddaughter’s wedding the pink turban presented by Modi, and the Opposition parties had stopped feigning horror over the Indian Prime Minister’s ‘audacity’ of making an unprecedented visit to an enemy country without the trappings of elaborate security arrangements and rigmarole of protocol that is fine-tuned by countless official meetings on both sides, terror struck at the Pathankot air force base. The dark deed dealt by the Pakistani terrorists of the Jaish-e-Muhammad (JeM) network had all the portents of derailing the Foreign Secretary-level talks between the two countries. The naysayers had a field day, laying thick their distrust of Pakistan’s sincerity to hold the talks. They recalled Home Minister Rajnath Singh’s statements regarding India’s readiness to give Pakistan a befitting reply, made on similar occasions in the past, and harped on military action against Pakistan for its overt asymmetric operations. The least that India could do, they said, was to call off the FS-level talks to redeem its image as a country that would not compromise its territorial integrity. The Modi government did not, however, succumb to the temptation of playing into the hands of the jingoists. 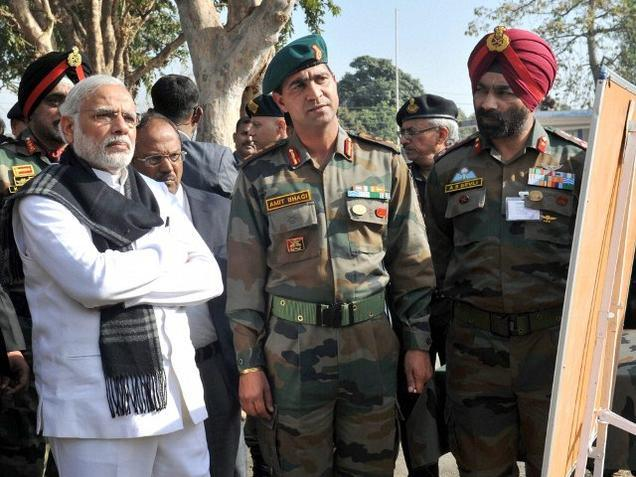 It plodded on in its pre-determined course of action and demanded action from Pakistan, that too immediately, to bring the perpetrators of the dastardly act in Pathankot to book. The Sharif government agreed to cooperate with India and in a seemingly swift move in departure from its dismal track record in the past, took necessary action to raid several offices of the banned terror network JeM, arrest its chief Maulana Masood Azhar, his brother and several operatives connected with the incident at Pathankot and seal off the terror network’s facilities ahead of an investigation into India’s complaint. It also proposed deputation of a Special Investigation Team (SIT) to Pathankot to collect evidence which, it said, would strengthen the legal case against the perpetrators. India welcomed the first right steps made by Pakistan. However, Defence Minister Manohar Parrikar subsequently made it abundantly clear that no Pakistani team of sleuths would be allowed access to the airbase. India nevertheless assured Pakistan that the FS-level talks would not be linked to the SIT’s proposed visit. In fact, the Indian side provided more proof sought by the Pakistani authorities to pin the culpability of the foot soldiers of JeM to the dastardly attack. Meanwhile, India and Pakistan have agreed to defer talks between their Foreign Secretaries while an investigation into the deadly Pathankot attack is carried out. It seems the Indian authorities are cautiously moving forward in keeping with Prime Minister Modi’s advice: “Trust, but verify”. To this end, they have asked their Pakistani counterparts to provide documentary evidence and proof, like the FIRs filed against the JeM leaders, details such as the sections of law under which the accused are booked, locations of their cells and their photographs in custody, etc to convince themselves that concrete action has indeed been taken against the culprits. It has also been made very clear to Pakistan that unless this documentary and supporting pieces of pieces of evidence are received, it would be difficult for the Foreign Secretary to travel to Islamabad. It should not be forgotten that following the detention of JeM chief Maulana Masood Azhar, Lt Gen (Retd) Abdul Qadir Baloch, Pakistan’s Minister for Frontier Regions, said that Azhar had been taken into “protective custody.” This statement exposed how hollow Pakistan’s official claim that Azhar had indeed been arrested. What both India and Pakistan have agreed upon as of now is that the proposed meeting of the Foreign Secretaries must take place as it is the first step towards the restarting of the dialogue process necessary for the officials to start ministerial meetings and subject-specific discussions. Pakistan is, however, yet to set the stage for the talks by providing the proof of its seriousness to punish the culprits of the Pathankot incidence as well as the perpetrators of the Mumbai massacre. It also has to carry out its international obligations by outlawing the various terrorist networks operating on its soil, overtly or covertly. Be that as it may, a war is no substitute to talks. That is the reason for the guarded position taken in unison by the Modi and Sharif governments over the Pathankot incident. The government of Pakistan took the rather unusual step of promptly denouncing the incident. India held JeM responsible for the dastardly act and provided the government of Pakistan all the evidence and proof to substantiate its charge. It took great care not to accuse the government of Pakistan or any of its agencies of complicity. Pakistan, on its part, did not dismiss the charges against terror operatives based on its soil, like it used to in the past and apparently got its act together by cracking down on JeM. Nawaz Sharif expressed determination to act against the perpetrators of terror in India operating from the Pakistani soil once the documentary and supporting pieces of evidence provided by India were verified. An irksome factor that should not be lost sight of is that in the past no amount of evidence supplied by India in such cases was considered ‘adequate’ by Pakistan. Furthermore, the evidence and proof provided by India, this time around, is considered adequate and what eventually comes out of the investigations as well as what action the Sharif government takes against the perpetrators as and when their guilt is proved in the Pakistani courts, remain to be seen. It is in this context that the Pakistan government has stated that additional information would be required for which it is considering sending an SIT to Pathankot in consultation with the government of India. In terms of its international obligations, Pakistan is required to follow up the leads contained in the actionable intelligence provided by India. Whether the Sharif government proves strong enough in real terms to withstand the pressure likely to be mounted by the Pakistan army and ISI, which have been underwriting the terror networks thriving in Pakistan, is yet another moot point that begs an answer. As of now, the most heartening development concerning the Pathankot incident has been the condemnation of the incident by the government of Pakistan as a subversive tactic by forces bent on the derailment of the peace process between the two countries to be put in motion. The Sharif government has also stated that no terror group would be allowed to derail the dialogue process. Irrespective of whether Pakistan’s determination to push the talks through, as articulated by Nawaz Sharif, flows from the understanding between the two Prime Ministers at Lahore or on account of pressure from the US and China, so long as Pakistan delivers on the creation of conditions congenial for the FS-level talks, it would augur well for further forward movement. It is distressing to note that Pakistan’s track record of recalcitrance and reluctance to break away from its old ways of fouling up the atmosphere on the eve of peace talks became once again evident when there was yet another terror attack on an Indian establishment – the Indian Consulate in Mazar-e-Sharif. Furthermore, the Ministry of External Affairs has stated that the trial of the Mumbai attack case was a “test” of the sincerity of Pakistan in combating terrorism directed against the country. According to the Ministry, while it was decided that the issues pertaining to terrorism would be handled by the National Security Advisers of the two countries, it was obvious that at the meeting of the Foreign Secretaries the Pathankot attack would be raised by India. Our country is also expected to take up the incidence of the shooting down of a US-made Helium-filled balloon flying at about a height of about 25,000 feet on January 26 in Jaisalmer district of Rajasthan when it was picked up by the Air Force radars, which were on high alert in view of the Republic Day celebrations. The balloon had come from Pakistan and Indian authorities believe that it could have been floated in an attempt to gauge India’s response time. It could be a wanton act of kite flying to test the troubled waters. Besides, there have been reports about failed attempts to infiltrate into India by a couple of terrorists from across the border after the Pathankot incident. India’s position on peace talks with Pakistan has been succinctly put in the following words by President Pranab Mukherjee in his address to the nation on the occasion of the country’s 67th Republic Day: “There will be disputes among nations; and, as is well-known, the closer we are to a neighbor, the higher the propensity for disputes. There is a civilized way to bridge disagreement; dialogue, ideally, should be a continual engagement. But we cannot discuss peace under a shower of bullets.” This was precisely the stance that Narendra Modi had taken as his party’s Prime Ministerial candidate in the 2014 Lok Sabha elections. It has thus been made abundantly clear to Pakistan and the rest of the world that there has been no shift in India’s principled stand on the issue of resolution of differences with Pakistan. Meanwhile, if the latest news reports are any indication, Pakistan seems to have made a complete U-turn on promises made in the Pathankot attack case and decided to follow the familiar pattern of letting terrorists who have targeted India off the hook. Terming the evidence provided by India as insufficient, the Pakistan government has reportedly given a clean chit to Jaish-e-Mohammed chief Maulana Masood Azhar in the case and claimed that some lower-rung members of the terrorist organization could have been involved in the Pathankot assault. Though India has not responded or reacted to these latest developments, the clean chit to the JeM chief seems to have upset the Indian security establishment that was looking for stringent action against the Jaish and its chief. Now it is up to Pakistan to take a principled stand in the matter of taking stern action against the terrorists operating from its soil in keeping with its assurances repeatedly made to India as well as the international community in the past. In short, Pakistan is obliged to walk its talk before there could be any more meaningful talks on peace at any level. It is now Pakistan’s call to accept India’s offer for peace talks in real earnestness so as to live in harmony with its conjoined sister nation. Should it, however, decline India’s offer, it would slide back into a position where it would end up a prisoner of its own making, having to deal with the various terror networks on its soil. As for India, it is, in any case, a win-win situation. If Pakistan chooses to carry out the much-needed course correction of its policy on terrorism for its own good as well as the good of the region, it would be the beginning of a realistic exercise in the quest for lasting peace. Else, Pakistan’s bluff would be called, reducing it to the Emperor with no clothes. India and Pakistan are two ends of the thread which cannot be made one else the entire concept will fail. It is better that India maintains a no-talks policy with the neighbour. Pakistan is using terrorism agianst us and if anyone says that India should react in the same manner then it is foolishness. Take harder route instead, convince them with peace talks. India is partnering with US over deploying ships at South China Sea for the protection of territorial waters, in return now China will use Pakistan against India. What about jet sold by America to Pakistan in the name of combating terrorism? Will Pakistan not use them against India? India should talk to America and not with Pakistan. There is a news in international media that India is testing its submarine nuclear device. If this happens China and Pakistan will become one in their ballastic missiles program and India will have to rely on Russia and U.S.
Once and for all please stop talking to Pakistan and do not pleade them to take action against terrorists. Instead, we should talk with P5 nations and strengthen our own nuclear capabilities. Whatsoever Pakistan does, they are strategically important to us since they are neighbour and also a nuclear-powered state. BJP should take the Vajpayee route in ending this bitter issue.